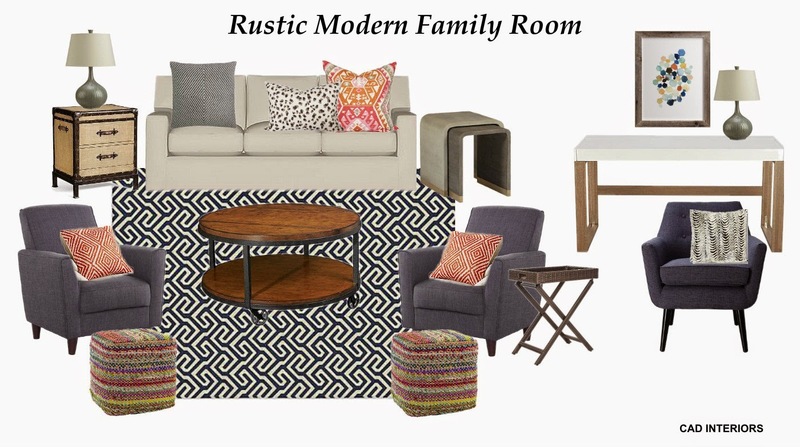 Rustic comfort mixed with modern lines was the goal of my latest design. This room design would work well for any family. The seating selections are relaxed and casual, yet have modern clean lines. Although the sofa is upholstered in a cream fabric, it is slipcovered for easy cleaning. The clean lines of the furnishings also help keep the room from feeling cluttered. The eclectic mix of tables (ranging from the warm wood coffee table to the faux shagreen nesting side tables) have varying textures, which provides lots of depth and interest. Nothing in the room design is too precious, which bodes perfectly for family living! Interested in a room design? Contact me for assistance at any time. I can work with you no matter where you live through my e-design services.